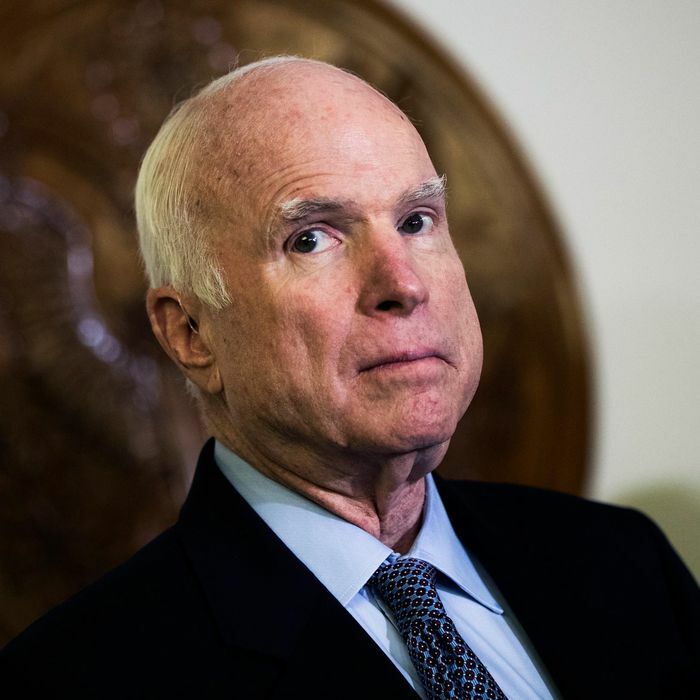 If the terminally ill Senator John McCain quits his Senate seat between now and November, Republicans now believe Arizona’s GOP governor can fill the vacancy without a 2018 special election. Republicans are increasingly certain that they have taken a potentially disastrous special Senate election in Arizona off the board as of the close of business Wednesday. Once that hour passes, the GOP believes that Arizona Gov. Doug Ducey, a Republican, will be able to appoint a successor to Sen. John McCain (R-Ariz.) if he leaves his seat this year. That person would serve until the next general election in 2020, Republicans say. The state election law they are relying on requires that the filing deadline for a special-election primary must be 90 days out from the primary date. Since the regular Arizona primary is on August 28, Republicans believe Ducey could refuse to hold any special election and instead appoint a temporary successor who would remain in office until 2020. Democrats might challenge that interpretation, but there’s no particular reason to think they would prevail. If so, that might reduce the number of potentially vulnerable GOP-held seats up this November from five to four (the other Arizona seat held by lame duck Jeff Flake; a Tennessee seat held by lame duck Bob Corker; and the seats of vulnerable incumbents Dean Heller of Nevada and — more of a reach for Democrats — Ted Cruz of Texas). With Democrats defending a larger number of vulnerable seats, the news from Arizona will make blood pressures go down in all sorts of places dependent on a future Republican-controlled Senate. Arizona Gov. Doug Ducey (R) on Tuesday quietly met with Sen. John McCain (R) and his wife, Cindy, at the couple’s home outside Sedona, Ariz., GOP sources in the state told The Hill. The meeting, which was not on the governor’s official schedule, comes amid speculation over whom the Republican governor would appoint to fill the Senate seat should the ailing 81-year-old senior lawmaker and Vietnam War hero unexpectedly leave office…. McCain allies in Arizona and Washington have been pushing for Cindy McCain to be appointed to her husband’s seat. For all sorts of reasons Arizona Democrats are inclined to keep their mouths shut. But they will privately renew their focus on the Flake seat, where their putative nominee, U.S. Representative Kyrsten Sinema, will face the winner of a fractious and right-tilting GOP primary involving Sinema’s House colleague Martha McSalley and the two noisy Trumpian wacko birds Kelli Ward and Joe Arpaio.